The moment I saw this mug years ago, I ordered a bunch for my tech-writer cohorts. Thanks for your kind words and the pointer to my blog post about branding--specifically, branding for writers. It's my favorite, and most visited, post so far. Can't wait to read your [sic] book. P.S. Cheryl, I hope you're reading this. 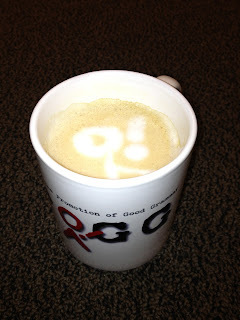 Now the SPOGG fans all know what everyone in your building already knows: baristas don't get any more creative than you. I am worried that you think the spelling of 'stationery' is incorrect. Were you joking? T2, you're reasonable to be concerned. We're just glad they've corrected the spelling. It was "stationary" when we posted that. We used the quotes around "stationery" to indicate we were talking about it as the word, not the object. SPOGG doesn't believe in using quotes for emphasis or sarcasm.